A Superb, Extended End of Terrace Family House in a Popular Residential Location. Enjoying a Pleasant Outlook Over the Green with Beautiful Rural Views to the Rear. 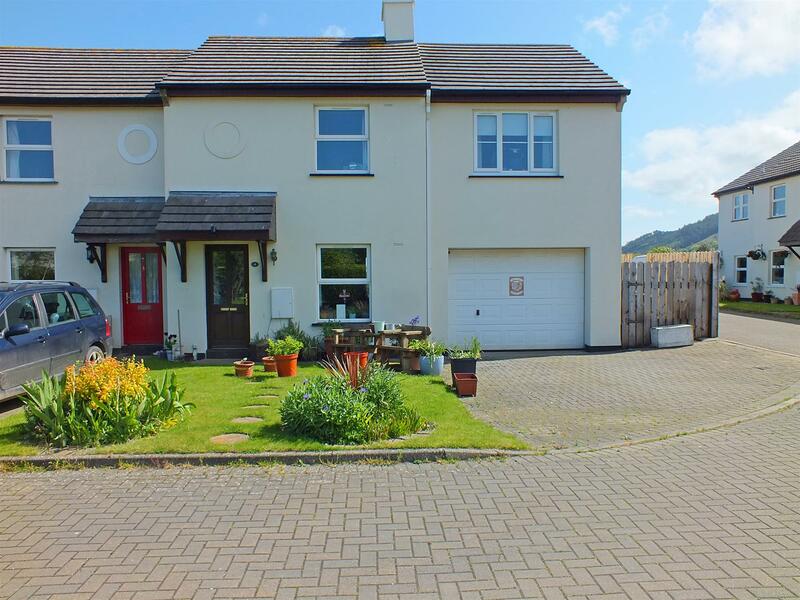 Walking Distance to Primary School, Park, Spar / Post Office, Pub & Main Bus Route. 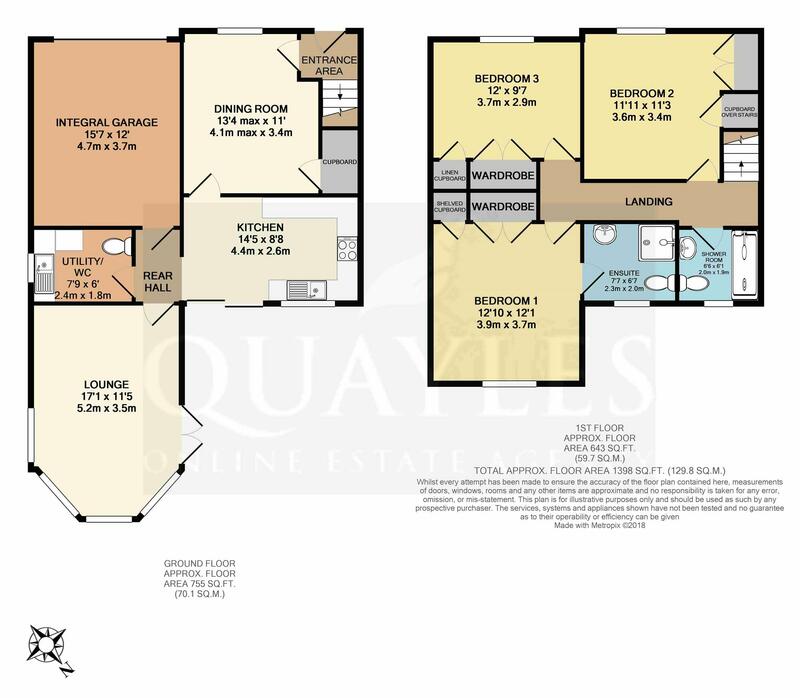 Offered in Excellent Order Throughout with an Above Average Amount of Storage. Comprising Spacious Dining Room, Modern Kitchen & a Fabulous 17ft Lounge. Utility Room / WC and Large Single Integral Garage / Workshop. 3 Large Double Bedrooms with Built In Wardrobes, 1 En Suite & 1 Family Shower Room. Gas Fired Central Heating & uPVC Double Glazing. Replacement Fascias & Soffits. Open Plan Frontage with a Block Paved Driveway Providing Parking for 2 Vehicles. Enclosed Rear Garden with Lawn, Patio & Side Area Having Small Beds & Greenhouse. Travel out of Kirk Michael in a Northerly direction and into Ballaugh. At the bridge turn left into Station Road just prior to the Raven Hotel Public House then passing the Spar / Post Office. Take the fifth turning on the right into Glebe Aalin and follow the road round keeping to the left hand side. This leads into Glebe Aalin Close where number 4 will be found at the end of a terrace of four and being clearly identified by our For Sale board. Part obscure double glazed entrance door. Stairs lead off to the first floor. Smoke detector. Solid wood floor covering continues into the dining room. A spacious room which doubles as a study and was formally the lounge. Deep set understairs cloaks cupboard with a light, fitted shelving and coat hooks. A uPVC front window enjoys pleasant views across the garden and over the green. TV, satellite and telephone points. Centre light on dimmer control. Part glazed door to the kitchen. A naturally bright room enjoying rural views via a uPVC window and sliding patio doors which lead to the rear garden. Fitted with an excellent range of beech effect wall, glazed display, drawer and base units together with laminated work surfaces incorporating a stainless steel sink with a lever mixer tap. Space for a freestanding gas cooker, fridge freezer and additional appliance such as a dishwasher. Tiled splashback and floor. Coved ceiling with florescent lights. 'Alpha' gas fired condensing boiler. 'Silavent' extractor. Clear archway to the rear hall. Tiled floor. Part glazed door to the lounge. Doors to the utility / cloakroom and integrated garage. Ceiling spotlight. A fabulous addition to the property, having four uPVC windows and double doors leading out to the side patio. Enjoying superb rural views. Fitted shelving to alcoves along with display shelving above the windows. Ceiling light / fan and additional spotlights. TV, telephone and satellite points. Solid wood flooring. Fitted wall and base units to match the kitchen. Laminated worksurfaces incorporate a stainless steel sink and mixer tap. Tiled splashback. Obscure glazed uPVC window. Plumbed for a washing machine. White WC. Fitted shelving. Pull up airing rack. Ceiling spotlight. A generous single size garage which is currently utilised as a workshop with an up and over panelled entrance door. Light, power and extensive shelving. Access to the part boarded and insulated loft. Three power points. Smoke detector. The former bathroom which has been fitted with a large step in enclosure with aqua boarded walls, glass screen and a fully plumbed shower. 'Roca' WC and a pedestal basin with a tiled splashback. Obscure glazed uPVC window. Wall mounted towel rack and vanity unit. 'Silavent' extractor. Tiled floor. Formerly bedroom 1, therefore an excellent double room which could easily accommodate a 6ft or twin beds. Enjoying a pleasant outlook over the front garden to the green beyond. Television, telephone and satellite points. Measurement given excludes a built in cupboard over the stairs along with a deep set, recessed double wardrobe with a hanging rail and shelf. A further generous double room enjoying the view over the green via a uPVC window. Measurements exclude a built in double wardrobe with a hanging rail, shelf and automated light, plus a shelved linen cupboard. Space for additional freestanding furniture. Television, telephone and satellite points. Modern light fitting. A fabulous addition to the property, enjoying stunning views across the adjacent countryside from the north to the east and taking in the mountain, via a uPVC window. Ample space for a 'Super King' size bed. Measurements again exclude a recessed double wardrobe with a hanging rail, shelf and light, together with an additional fully shelved cupboard. TV, satellite and telephone points. Door to the en suite shower room. A spacious room which has been fitted with a large enclosure housing a fully plumbed shower with tiling to the walls. Push button flush WC and a pedestal basin with splashback tiling, a glass shelf and illuminated mirror above. Vanity unit. Double glazed window. Tiled floor. Extractor. Well fenced with a shaped lawn and patio. A pathway leads around the side of the property with growing beds and a green house. External light and power point. Cold water tap. Gated access to the front drive. In addition to the garden is a paved walkway located behind the rear fence and bound by a Manx hedge. The pathway leads to the two neighbouring properties with number four owning one third. All mains services are installed. Gas fired central heating & uPVC double glazing. Replacement fascias and siffits. EPS external coating 2014. Fitted carpets and floor coverings.